HARLEM — A new Uptown business locks you and a group of friends in an abandoned asylum and gives you 60 minutes to escape. The asylum isn’t real, it’s one of four intricately decorated “escape rooms” where friends have to solve puzzles, find hidden doors and clues, and unlock combinations in order to get out. “You cannot really escape unless you collaborate with each other,” said Michele Ware, founder of Hoodwinked Escape, a new live-action role playing game Uptown. Ware first found out about escape room adventures in November 2014 when she was working in corporate finance and had to find team-building activities for her co-workers every year. She loved the concept so much she left her job in corporate America in February to focus on Hoodwinked full-time. She even worked with a European “escape consultant” who helped her develop the clues and themes for each of the four rooms: a Hangover room, a Spirit of Harlem, the Abandoned Asylum and the Military Mission room. "Once you get into the room it's like you become one of the characters," said Bernard Fisher, a participant. "What happens is certain personalities come out. One person finds a clue and another will get a better understanding of it. We all just ended up coming together because that was the only way we're going to get out." Each room is filled with potential clues like photos on the walls and books on shelves to the wallpaper or the furniture. The clues are designed to be difficult to solve but not impossible. Each group get five hints they can phone in during their hour. The activity is great for businesses hosting team-building exercises or people who like to be spontaneous, Fisher said. "I think also for the schools, because everything is so computerized and tech this and tech that, that a lot of things are done for them," he added. "The Harlem room would be great for students." Based on trail runs, less than 30 percent of the groups escaped within the hour time limit. Those who escape Hoodwinked rooms will receive a discount toward their next adventure, she added. 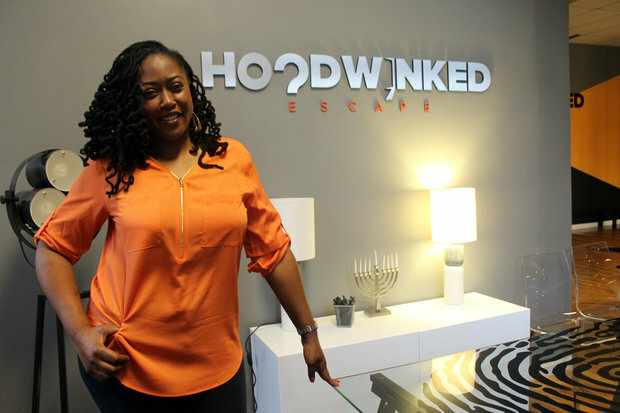 It costs $28 per person for one hour in an escape room and Hoodwinked is offering discounts throughout the month of December. Their first guests will try to escape this weekend and reservations are booked through December, owners said. Ware and her staff view everything that is going on in the rooms from their control room. For businesses hosting team-building events, a psychologist sits in and watches to find out how people work together to solve the puzzles.